Ask Disney Adulting | Where Do I Get Those Custom & Group Disney Shirts? Okay, we’ve all seen them, those charming little families wandering around in matching group shirts? The gaggle of gals strutting around Epcot with boozy-themed Disney shirts. Or that couple with the shirts so unique you know that they were custom-made especially for them. It doesn’t matter if you are “into” group shirts or not, sporting something unique at Disney parks is becoming the fashion trend you won’t want to ignore. But, where the heck do these people get these shirts? There’s an entire community out there for this and they range from professional t-shirt shops to the in-home crafter who is using a simple iron on transfer. No matter the choice, you can find plenty of places online to either get supplies to make your own, order predesigned and printed shirts, or snag some professional apparel. However, a word of caution to the buyer – not all crafters are the same and sometimes that low-low price means that you get exactly what you paid for – cheap quality brand shirt and a design that doesn’t stay. Ouch! Bonus: I’m going to give you instructions and links so you can recreate these looks at home – or buy versions of them online. Surprise! It’s not the design. It all begins will selecting the right shirt. It doesn’t matter how creative your design is or how the garment is “printed.” It’s all about getting the most comfortable shirt in the right fit. Remember, you are going to be wearing one of these pretty much every day, all day, at Disney Parks. Don’t get some lame cheap Walmart special! For my shirts, I use almost exclusively Bella + Canvas Unisex styles because of their soft, comfortable fabric and the loose fit, which is ideal for that muggy Florida weather. At first, I used to buy them online. However, with my background in graphic design, I would find myself wanting to customize or create my own shirts. So, I start producing my own in-house with professional grade HTV vinyl and high-heat press. I’ve even gone so far now to dedicate an entire room in my home to t-shirt design and production. You’ll often find me rocking out to Disney tunes working away on new designs or fulfilling orders via my Esty shop. Alright, here’s where I’m going to drop the deets on how to make each one (or purchase) the designs or shirts I wore on my most recent trip to Walt Disney World. Don’t have the equipment but still want this shirt? Ask Us! 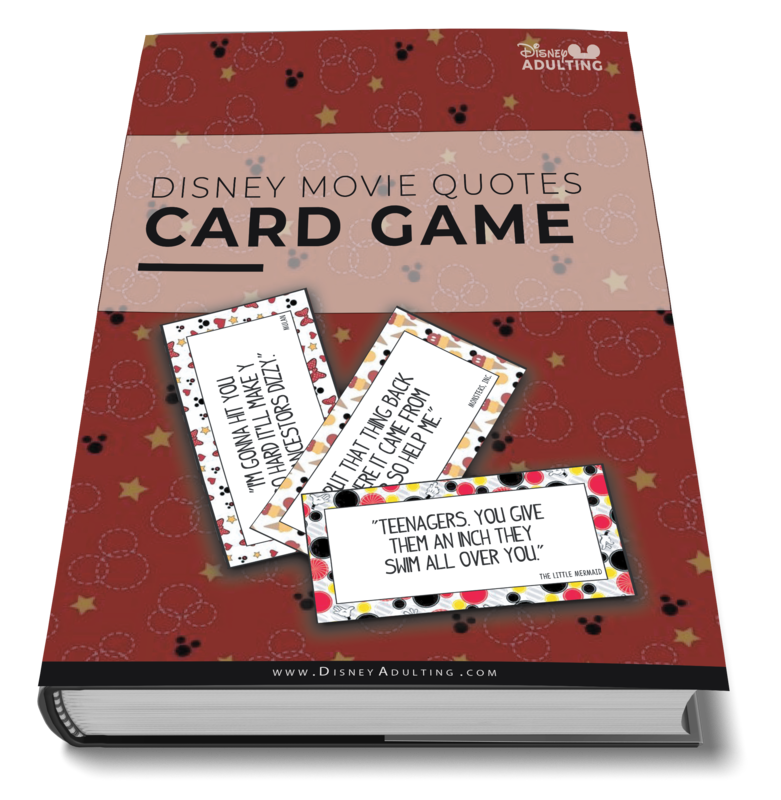 Note: This isn’t a Disney Adulting design, so we can’t guarantee the quality or any changes that the creator has made since our purchase/use. Looking to Get Something Custom? Do you make or order custom shirts for Disney?